Click here to download this Campaign for Ethical Marketing action sheet as a two-page pdf file. Background: A new monitoring report from Armenia produced by the "Confidence" Health Non-Governmental Organisation has found widespread violations by Nestlé and other companies. "Confidence" has been raising some of the violations with the companies for many years. You helped stop Nestlé advertising infant formula when it first arrived in the country in the 1990s. Now we are asking for your help again. "In the resuscitation unit of a hospital and in one maternity house doctors said that Nestle gives free supplies of special formula “Alfare”, they just need to fill in a request form. “Confidence” monitors have reported this practice since 2003. Nestle claims that is the free samples cannot be viewed as promotion because the product is not sold in the retail outlets. However “Confidence” considers that this is a form of promotion of other Nestle brands, because giving an infant “Alfare” undermines breastfeeding, making it almost impossible after a period of time so that after discharge from the hospital the infant will require formula and mothers are likely to favor products from the company whose samples they received." Nestlé promotes its formula range to health workers with health claims, including the 'protect' logos it has introduced on products in 120 countries. 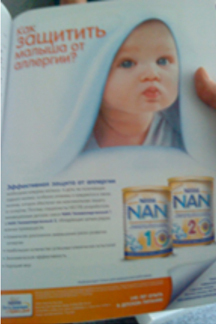 The advertisement shown here was in materials for a perinatal conference sponsored by Nestlé in Moscow in June 2011 attended by some Armenian doctors. Its message: “How to protect the child from allergy”. The 'protect' logos are also featured in promotion for Nan formulas (below). 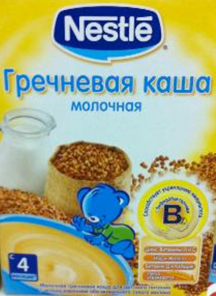 Nestlé continues to market complementary foods labelled for use from 4 months of age in breach of the National strategy of infant feeding of Armenia. "Confidence" reports that it is also illegal to advertise products for use before 6 months of age in Armenia, but Nestlé does so. Its cereal advertising undermines the receommendation to exclusively breastfeed for 6 months by claiming that "Nestle cereals protect the infant from inside". "Confidence" reports finding booklets in doctors' offices for the range of four products in the Nan formula range, including the infant formulas. It reports that the name of the booklet, "is “NAN - 4 stages of protection”. Every page of the booklet explains the benefits of breastfeeding and on the other side places the same benefit for NAN." Nestlé's own Policy and Instructions for Implementation of the WHO International Code of Marketing of Breastmilk Substitutes do not include substitutes marketed after one year of age within their scope. Even if Nestlé was correct to consider these complementary foods and not substitutes, they are covered by Resolution WHA 49.15 which calls for measures "to ensure that complementary foods are not marketed for or used in ways that undermine exclusive and sustained breastfeeding." 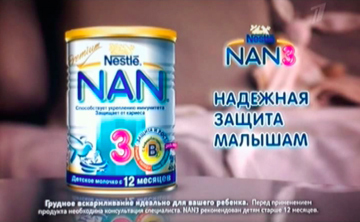 Nestlé advertises its Nan brand in Russian on satellite TV, highlighting the claims it makes in its idealising 'protect' logo. 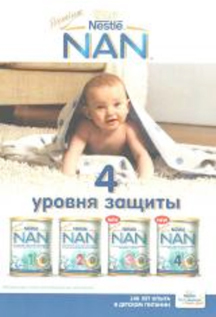 Nestlé attempts to circumvent the prohibition in Armenian law on advertising infant formula, by showing the 3rd formula in the range, promoted for use from 12 months of age. However, it is both cross promoting the full range and is undermining continued breastfeeding, which WHO recommends continues into the second year of life and beyond. Suggested letter to the man responsible: Mr. Paul Bulcke, Nestlé S.A. Avenue Nestlé 55, Vevey 1800, Switzerland. Fax: +41 21 924 4800. Or use our Email Nestle page. Despite thousands of messages from people around the world, Nestlé continues to promote its breastmilk substitutes with the claim that they 'protect' babies. As you know, babies fed on substitutes are more likely tobecome sick than breastfed babies and, in conditions of poverty, more likely to die. New evidence from Armenia shows how this campaign includes distribution of pamphlets to doctors' offices that promote Nan 1 - 4 and imply equivalence with breastfeeding, and advertising of Nan 3 on Russian television that appears in Armenia and sponsorship and advertising at a Moscow health conference. Please act on the calls to stop all forms of promotion. I also repeat the call made many times that you stop promoting complementary foods from 4 months of age. Background: Baby Milk Action is asking members of the public in the UK to sign an ePetition on the Prime Ministers website, with the plea: Deliver on the Government's Infant Feeding Obligations. As part of its austerity programme, the UK Coalition Government has scrapped the Infant Feeding Coordinator posts at the Department of Health and did not support National Breastfeeding Week in 2011. "Due to reduced budgets this year, the Department was unable to co-ordinate the National Breastfeeding Week and provide free resources for local events. However, support and information is currently available to health professionals and parents via NHS Choices, the National Breastfeeding Helpline, UNICEF UK Baby Friendly Initiative and local peer support programmes." "The Department recognises the evidence-based health benefits of breastfeeding both for the mother and her baby and the savings to the NHS. The Department’s approach is to support all parents and parents-to-be with information to enable them to make an informed choice when deciding how to feed their baby." The latest update of the NHS Guide to Bottle Feeding was produced just before the Infant Feeding Coordinator posts were scrapped. 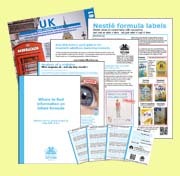 This was used as a reference for the film Infant Formula Explained, produced by Baby Milk Action on behalf of the Baby Feeding Law Group (BFLG) for health workers to use with parents and carers who indicate they intend to use formula. The Department says it is "reshaping the whole health and social care system" and "the Department of Health will issue a series of policy statements including the final outcomes framework in the autumn". The scrapped posts are called for in the Global Strategy for Infant and Young Children, which the UK supported when it was adopted by the World Health Assembly in 2002. Indeed, the Global Strategy also calls for a "multisectoral national breast-feeding committee composed of representatives from relevant government departments, nongovernmental organizations, and health professional associations." Providing correct information is only half of the story. Misinformation also needs to be stopped. The UK is a signatory to the Convention on the Rights of the Child, but fails to act on repeated calls to stop baby food companies violating child rights with their aggressive promotion of baby foods. The UN Committee on the Rights of the Child said in its last report on the UK (2008) that it is "concerned that implementation of the International Code of Marketing of Breastmilk Substitutes continues to be inadequate and that aggressive promotion of breastmilk substitutes remains common." Violations can be reported to the Baby Feeding Law Group monitoring project, which Baby Milk Action coordinates. 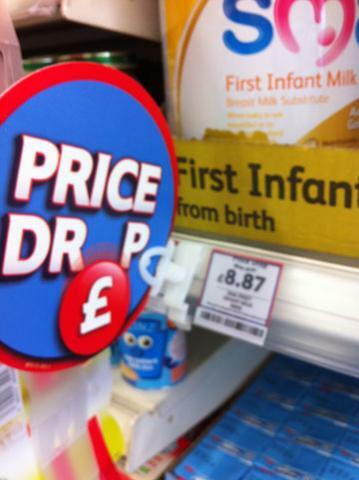 In October 2011 this resulted in Tesco's illegal promotion of infant formula being stopped. A review under the last government acknowledged concerns raised by Trading Standards and other bodies over enforcing the measures and stated there need to be "steps taken to address these." The UK Government gave its support to the Global Strategy for Infant and Young Child Feeding when this was adopted by the World Health Assembly but has yet to fully implement its provisions in the UK. The Department of Health has said it, "recognises the evidence-based health benefits of breastfeeding both for the mother and her baby and the savings to the NHS." Action will also protect babies who are fed on formula by ensuring parents and carers receive accurate, independent, evidence-based information. Full implementation of the International Code of Marketing of Breastmilk Substitutes and subsequent, relevant Resolutions of the World Health Assembly in legislation in all countries of the UK. The UN Committee on the Rights of the Child has repeatedly called on the UK to take this action. Appoint national infant feeding coordinators supported by multisectoral committees. The Government scrapped the coordinator posts in March 2011.